Ubisoft has confirmed it will show the next Assassin’s Creed title at E3 2017, which shouldn’t surprise anyone considering the game has been leaking like a sieve. It also looks like Aisha Tyler won’t be returning this year. 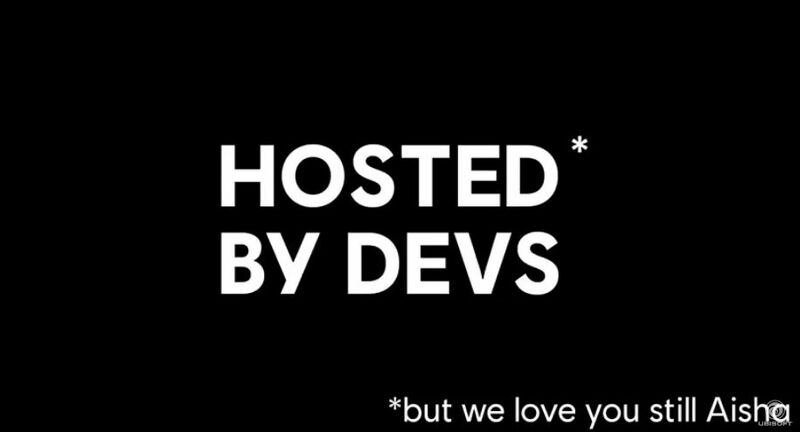 At the end of the teaser video above it notes the show will be “hosted by devs” with the line “but we still love you Aisha”. Moving on, the publisher stated its presentation at E3 2017 will include more on Far Cry 5 and South Park: The Fractured But Whole, along with details on the latest installments of Assassin’s Creed, Just Dance, and The Crew. In addition, Ubisoft said it will “offer up new titles across a variety of platforms,” one of which is likely the Rabbids and Mario mash-up for Switch titled Mario + Rabbids: Kingdom Battle. What the other new titles set for a reveal at the show are is anyone’s guess. Unless you know something we aren’t aware of at the moment. The next game in the Assassin’s Creed franchise, said to be titled Assassin’s Creed: Origins and set in Egypt, has become one of the worst kept secrets in video games of late. First word on the game stated it was titled Assassin’s Creed Empire, then leaks came via screen-capped images showing the protagonist, the return of boats, and most recently, a t-shirt spotted at GameStop. The game is also expected to be released during Ubisoft’s current fiscal year which ends on March 31, 2018; however, whispers on the internet say to expect it in October. In its financial report, the firm said The Crew 2 is also slated for the current fiscal year, and a new release date was finally provided for South Park: The Fractured But Whole. Far Cry 5 was revealed last week, but more on the game will be shown at E3, as expected. It’s out next year on February 27, so we have a while to go on it. Of course, we expect to hear more on future plans for The Division Year 2, any For Honor updates in the works, some Ghost Recon: Wildlands and Rainbow Six Siege news, and plenty more. Ubisoft’s E3 2017 Conference takes place on Monday, June 12, starting at 1pm Pacific, 4pm Eastern, 9pm BST, 10pm CEST. As always, we’ll be squeezing every bit of news that comes out of it for your reading pleasure.